Our goal is to engage with environmentally conscious local governments, and provide a breakthrough technology that will significantly assist them in achieving their recycling and diversion rate goals. Zerocycle, the leader in software analytics for the Waste and Recycling industry, announced the launch of their Resident Engagement Platform in four pilot cities. The cities of Salt Lake City UT, Buffalo NY, Cincinnati OH, and Fremont CA are participating in Zerocycle’s revolutionary pilot program that is positioned to fundamentally change the industry’s analytics and outreach practices. Zerocycle’s low-cost, non-invasive solution employs innovative algorithms along with city-retained waste, recycling, and compost data to produce the behavior-changing Neighborhood Waste Report. By leveraging this readily available data, Zerocycle is able to quickly and economically launch the program within weeks, not months or years. 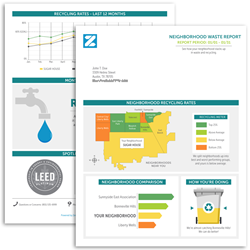 The heart of the Resident Engagement Platform is Zerocycle’s Neighborhood Waste Report (NWR) that is mailed to residents and features visually striking maps, Neighborhood rankings, and other insights on recycling. The NWR leverages behavioral psychology techniques, such as normative messaging, to drive measurable change in waste, recycling, and composting behavior. This form of behavioral science is proven to foster an environment of friendly competition between neighborhoods and residents, that ultimately increases recycling. Large city-contracted haulers, like Rumpke Waste & Recycling, traditionally provide marketing support to their government customers for education and outreach programs, and Rumpke is doing just that by sponsoring the Zerocycle program for the City of Cincinnati. "As a leader in the waste and recycling industry, we are always looking for ways to grow recycling participation," said Molly Yeager, corporate communications supervisor, Rumpke. "We are interested in seeing the results of this pilot program to see if it may be a valuable tool in other parts of our service region." In addition to the current four pilot projects, the company will be inviting four additional “launch partners” to participate in the program, to be announced later this year. Cities or Counties that are interested in being considered for the program can contact Rich Rothman, VP Sales, at 704-443-7640 or rich(at)zerocycle.co. Zerocycle is headquartered in Washington DC. Zerocycle is a clean tech Software and Marketing company which provides local governments with an innovative Resident Engagement Platform that significantly increases diversion rates and reduces waste. This low-cost, cloud-based solution is fused with data and behavioral science inspired technology that helps Mayors and their Solid Waste, Public Works, and Sustainability Departments reach their recycling goals. Zerocycle consumes readily available truck route and weight ticket data, as well as other open and proprietary data before producing the finished product: a citywide Neighborhood Waste Report for both city officials and homeowners that compares recycling effectiveness by Neighborhood. In essence, the company's "secret sauce" is its innovative algorithms and robust GIS platform which can sift through massive caches of city retained data to produce digestible, neighborhood specific waste and recycling information. The Neighborhood Waste Reports, which include full-color maps that rank the Neighborhoods' recycling effectiveness, are sent by Zerocycle to homeowners on behalf of the City. This form of messaging is known as “normative social influence” and it creates an environment of friendly competition which increases recycling throughout the region.